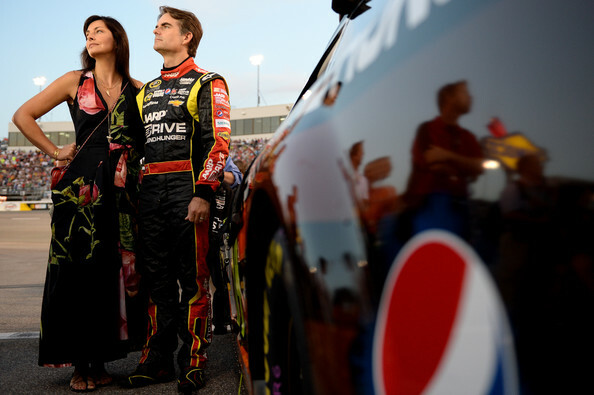 It wasn’t a work of art through the first 26 races, but Jeff Gordon qualified for the NASCAR Chase for the 11th time in the 12-year history of NASCAR’s championship playoff. 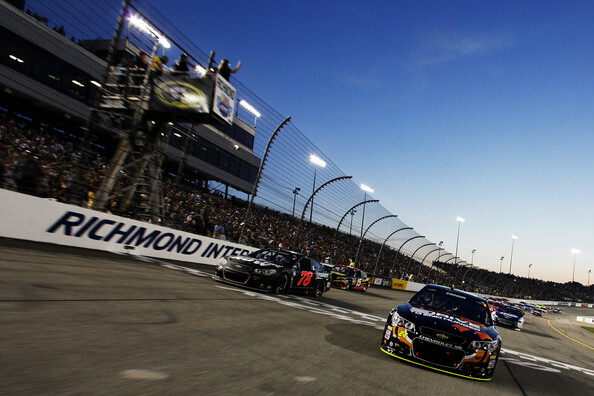 Gordon’s 7th place effort at Richmond clinched his spot in the Chase. Gordon started 23rd and was unable to make headway through the opening laps. The first caution came on lap 38 for Martin Truex’s wall contact. Following pit stops, Gordon made his way into the top-20 on lap 50. His forward advancement continued as he took 17th from Ryan Newman on lap 58. Gordon entered the top-15 on lap 70, and took 14th from David Ragan on lap 77. A debris caution brought pit stops just before lap 100. 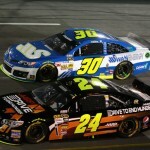 Gordon restarted in 13th place on lap 102. The third caution came on lap 112 for Michael Annett’s crash. Gordon pitted for tires and restarted in 13th. 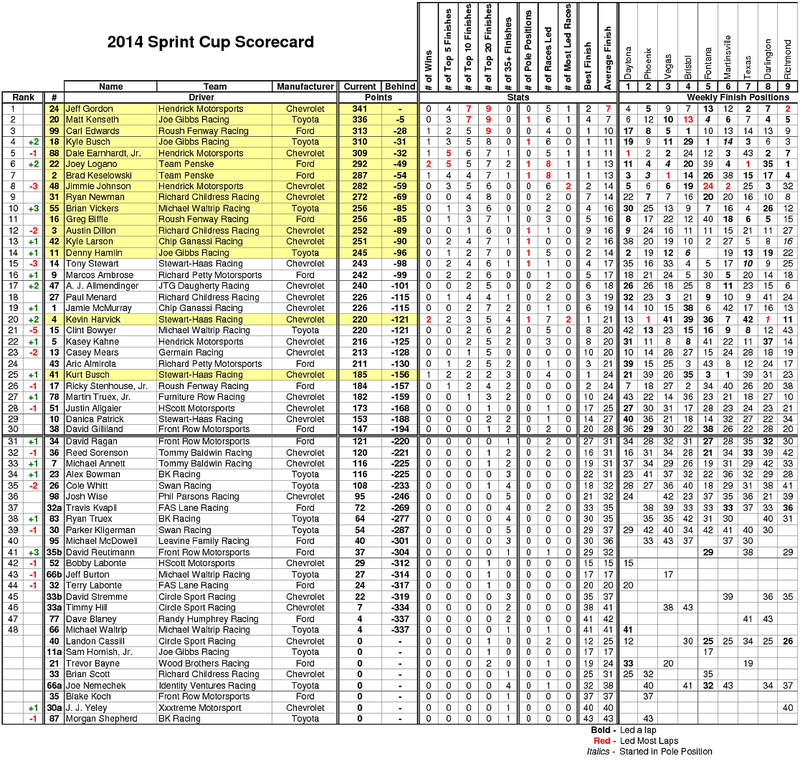 He steadily gained spots and moved into the top-10 on lap 150 with a move around Joey Logano. He took 9th from Kurt Busch, and then passed Carl Edwards for 8th prior to the halfway point. Gordon took 7th from Kyle Larson on lap 202, but slipped back to 8th when Aric Almirola passed on lap 209. A debris caution on lap 211 brought the lead lap cars to pit road. Gordon lost a spot in the pits and restarted 9th on lap 217. After briefly dropping to 10th, he regrouped to pass Carl Edwards and Kyle Larson for positions to run 8th on lap 230. A debris caution brought the leaders to pit road on lap 290. He held 8th through the round of pit stops, but moved to 6th place after Brad Keselowski and Jamie McMurray were penalized for speeding on pit road. Gordon entered the top-5 for the first time with 93 laps to go with a move around Jimmie Johnson. 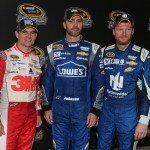 However, he fell out of the top-5 when Dale Earnhardt Jr took the spot with 89 to go. 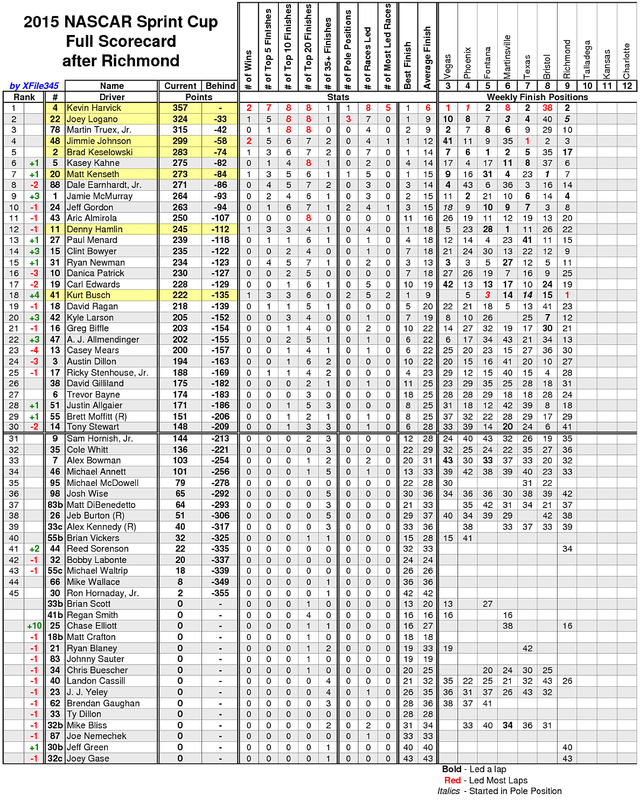 Gordon dropped to 7th when Almirola passed with 55 to go. With 26 to go, NASCAR threw a caution for debris. Pit stops followed with Gordon holding the 7th position. 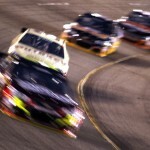 He crossed the finish line in 7th to clinch a spot in the NASCAR Chase. “It was a really solid night, so I’m proud of all the guys on the team. The first run I was a little nervous, we were hovering around 21st. We made a slight adjustment and started going to the front. I don’t know if we were a top-5 car, but we were definitely a top-10 car. Finished 7th, I’m just so excited we finally had a solid night on pit road, on the racetrack with the car, communication — everything was just really solid. So, that gives us something to be excited about over the next 10 races. These guys have been working so hard. I know everybody works hard, but they haven’t been getting the rewards of that hard work. So it’s nice to be in the Chase and take that breath and reset and see what we can do over the next 10. 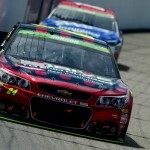 Jeff Gordon posted his 6th consecutive top-10 finish with an 8th place effort at Richmond. It’s the first time since March 2009 that Gordon posted 6 straight top-10’s. However, Gordon battled the handling on longer runs and was unable to seriously contend for the lead during the event. 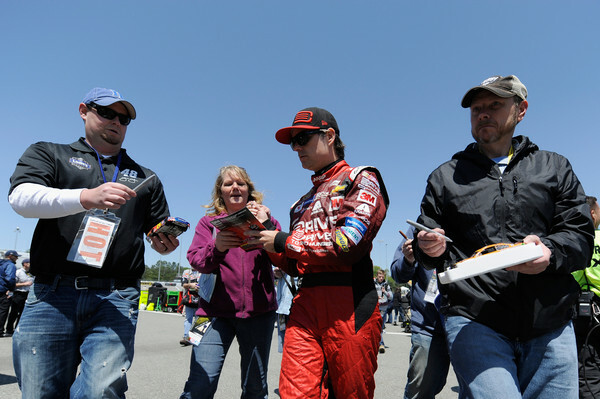 Kurt Busch scored his first win of the season and the 26th of his career to punch his ticket into the NASCAR Chase. 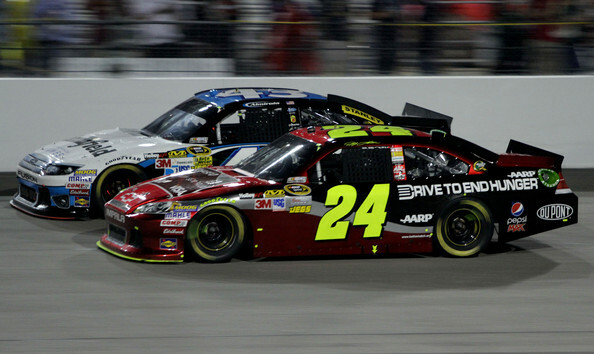 Gordon tied Mark Martin with the most lead lap finishes (558) in NASCAR history. After rain washed out the event on Saturday night, the drivers took the green flag shortly after 1pm/eastern on Sunday. Gordon started 11th and moved to 9th in the opening laps. He took 8th from Denny Hamlin on lap 13, and passed AJ Allmendinger for 7th on lap 25. He held the spot until the competition caution on lap 50. Pit stops followed with Gordon restarting in 7th place. He used the inside line to his advantage and took 6th from Matt Kenseth on lap 57. Gordon entered the top-5 with a move around Brad Keselowski on lap 60. Kenseth regouped to take a spot from Gordon lap 64. At the 100-lap mark, Clint Bowyer passed Gordon to send him back to 7th. He moved back into 6th with a pass on Joey Logano on lap 121. The next caution came on lap 128 following Joey Gase’s wreck on the backstretch. Gordon exited pit road in 7th. He slipped to 8th after the restart, but a caution for Josh Wise’s stalled car on lap 137 bunched the field for another restart. Gordon held 8th until the next caution on lap 163 for Wise’s blown engine. Pit stops followed with Gordon gaining two spots to restart in 6th place. Kasey Kahne jumped to the outside line to take a spot from Gordon on lap 170. 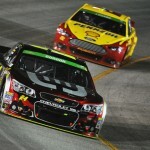 Just prior to the halfway point, Jamie McMurray passed Gordon to send him to 8th. He fell to 10th on lap 221 when Jimmie Johnson and Matt Kenseth went by. Gordon dropped to 11th after Dale Earnhardt Jr passed on lap 245. Chase Elliott passed Gordon on lap 253 to send him back to 12th. Gordon came to pit road for a green flag stop on lap 266 and cycled through in 16th place. A caution for Brett Moffitt’s blown tire slowed the field on lap 268, which trapped Gordon a lap down. However, Gordon took the wave-around to get back on the lead lap. He restarted in 15th place on lap 278. Gordon quickly gained two spots, and took 12th from Earnhardt Jr on lap 290. 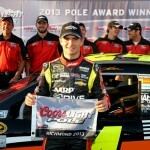 He re-entered the top-10 after passing Ryan Newman and Kasey Kahne. With 86 laps to go, he took 9th from Joey Logano. Ten laps later he took 8th from Martin Truex. A debris caution with 50 laps to go brought pit stops for the run to the finish. 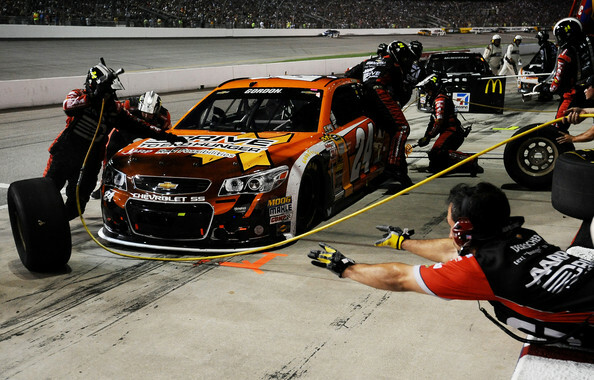 Gordon gained two spots in the pits and exited pit road in 6th place. On the restart with 42 to go, Gordon moved around Brad Keselowski before Tony Stewart spun to bring out a caution with 40 to go. On the restart, Joey Logano dove under Gordon to take a spot before a caution for Jeb Burton’s spin with 32 to go. With 18 to go, Kahne went by to send Gordon back to 7th place. Kenseth took a spot from Gordon with 13 to go. He crossed the finish line in 8th place. 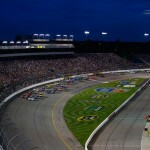 Brad Keselowski dominated the Federated Auto Parts 400 leading 383 out of 400 laps en route to the victory. 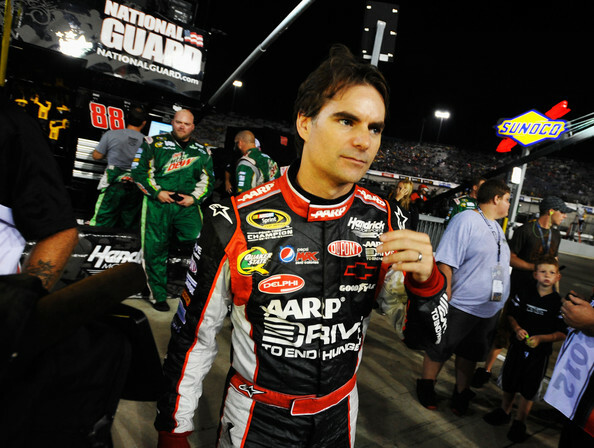 Jeff Gordon finished 2nd at Richmond for his third runner-up finish in the last 5 Richmond races. Gordon started 2nd and ran behind race leader Brad Keselowski for the first 30 laps before Kevin Harvick passed for position. He came to pit road in 3rd for the competition caution on lap 50. He dropped to 5th after the restart and settled into the spot for the next 40 laps. He took 4th from Jamie McMurray on lap 88 and ran in that spot at the 100-lap mark. A debris caution on lap 125 brought the leaders to pit road. Gordon gained two spots on pit road and restarted in 2nd place. 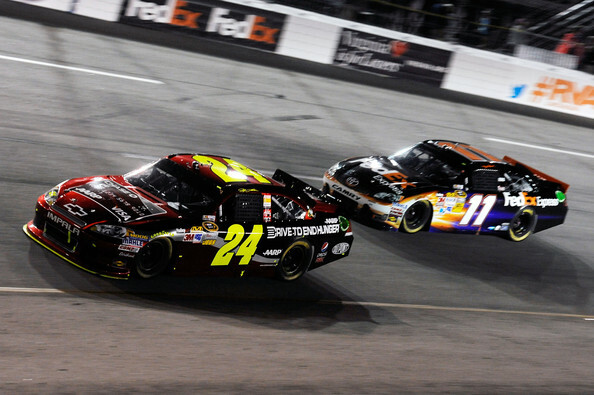 At the halfway point, Gordon ran in 2nd place behind Keselowski by more than 3 seconds. He came to pit road for a four-tire change on lap 232. 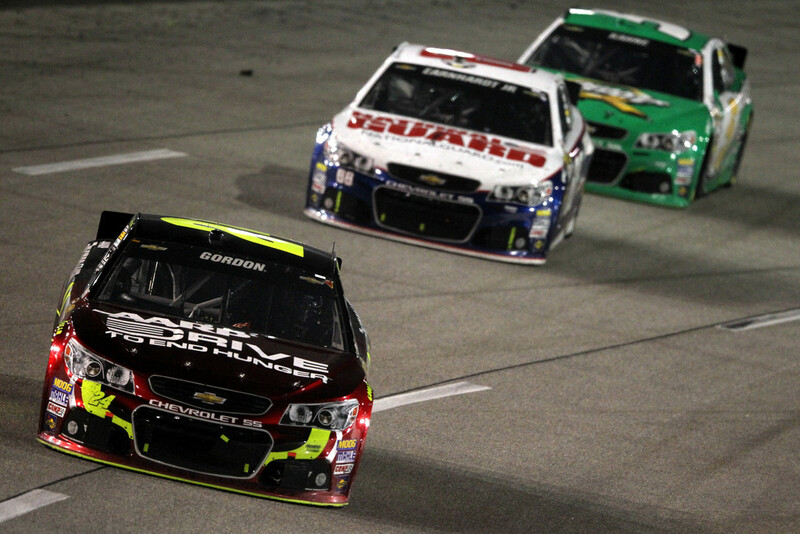 Following stops, Gordon ran 4th behind Keselowski, Harvick and Clint Bowyer. A debris caution slowed the field on lap 261 and brought pit stops. Gordon restarted in 4th place following the stops. He took 3rd from Harvick on lap 290. 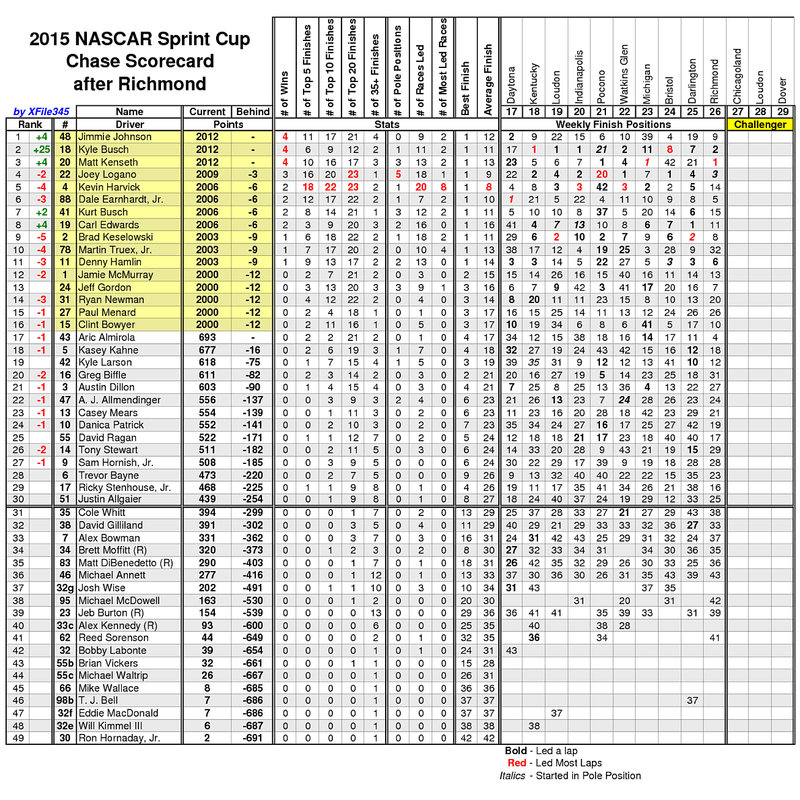 With 83 to go, Gordon moved into the runner-up spot ahead of Bowyer. The caution waved on lap 329 when a spectator attempted to climb over the catchfence in turn 4. The leaders came to pit road with Keselowski edging ahead of Gordon at pit exit. 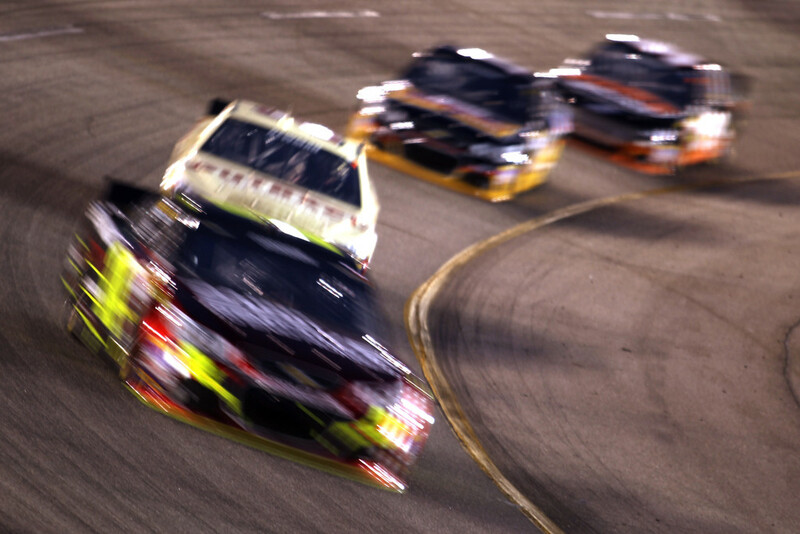 Keselowski pulled out to nearly a 2-second lead with 50 laps to go. As the laps wound down, Keselowski kept a consistent 2-second lead over Gordon and claimed the victory. 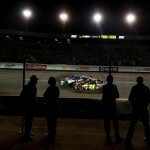 The field was distantly behind Brad Keselowski for the balance of the night. Gordon struggled at times with the tires. 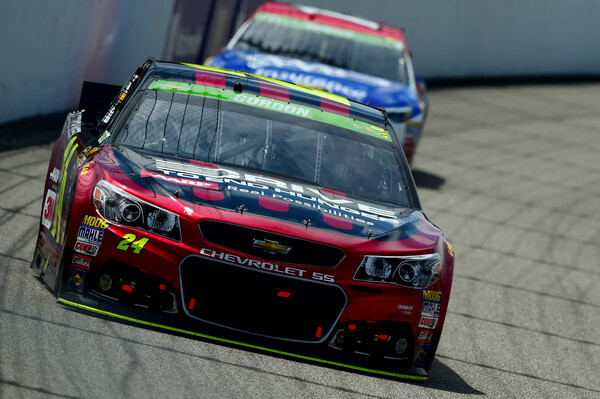 Jeff Gordon led 173 laps and finished 2nd in the Toyota 400 at Richmond International Raceway. Gordon had the dominant car on longer runs, but a series of late race restarts hindered his efforts. 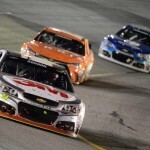 He dropped to 4th in the closing stages before moving up to 2nd behind race winner Joey Logano following contact on the track in a battle between Brad Keselowski and Matt Kenseth. It was Gordon’s 7th top-10 finish in 9 races this year. He remains the NASCAR points leader. Gordon started 25th and moved into the top-20 by lap 10. He ran 13th at the competition caution on lap 40. He gained four spots on pit road and restarted 9th on lap 44. He took 7th from Jimmie Johnson on lap 55 and advanced to 6th with a move around Joey Logano by lap 60. Gordon passed Dale Earnhardt Jr and Clint Bowyer to run 4th on lap 65. He took 3rd from Kasey Kahne on lap 68 and moved into the runner-up position around Kevin Harvick on lap 91. A debris caution on lap 99 brought the lead lap cars to pit road. Gordon gained a spot in the pits and restarted with the race lead on lap 104. A debris caution slowed the field on lap 161. Gordon held the lead through the pit stops. However, Brad Keselowski and Joey Logano went by on lap 174 to send Gordon to 3rd place. He regrouped and took 2nd from Logano on lap 188, and re-assumed the race lead on lap 210. A caution for debris on lap 226 brought pit stops. Gordon again held the lead through the round of stops. Logano took the lead from Gordon on lap 244 as the #24 again struggled early in the green flag run. Gordon passed Logano for the lead on lap 252 and set things on cruise control until a caution on lap 296 for Ricky Stenhouse’s wall contact. Dale Earnhardt Jr beat Gordon off pit road to claim the race lead. On the restart, Gordon dropped to 4th on the outside line before the tire pressures came up. 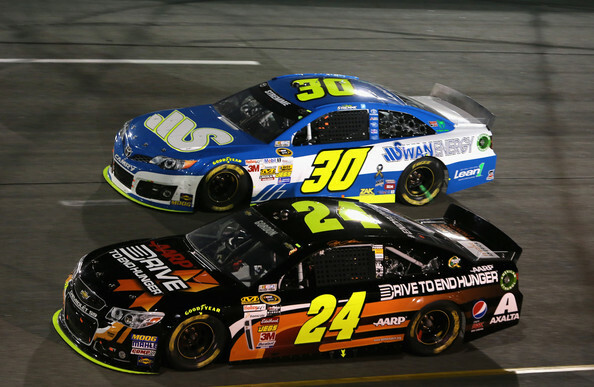 With 80 laps to go, Gordon took the 3rd spot from Earnhardt Jr. 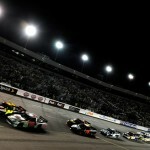 He passed Keselowski for 2nd with 68 to go and re-assumed the lead from Logano with 65 to go. With 39 to go, Matt Kenseth ran down Gordon and took the lead. A caution for Jimmie Johnson’s cut tire with 33 to go brought the final pit stops of the night. Gordon left pit road in 3rd place as he slowed near the exit of the pits to allow Earnhardt Jr to depart in 2nd, which gave Gordon the inside line behind Kenseth for the restart with 25 laps to go. On the restart, Logano got past Gordon prior to a caution for Denny Hamlin’s spin with 23 to go. Gordon started on the outside of the second row with 18 laps to go. He moved to 3rd when Logano spun his tires. A caution for JJ Yeley’s engine slowed the field with 15 to go. On the restart, Gordon moved to the runner-up spot behind Kenseth. With 6 to go, Keselowski moved along side Gordon on the outside line. Gordon held the line but lost a spot to Logano. 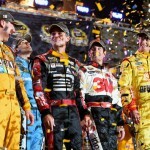 After Keselowski tapped Kenseth, Logano moved to the lead with Gordon in 2nd place. 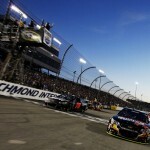 A four-way battle in the late stages between Gordon, Keselowski, Logano, and Kenseth was altered when Keselowski and Kenseth made contact, allowing Logano to open a healthy lead en route to the victory. Two points. 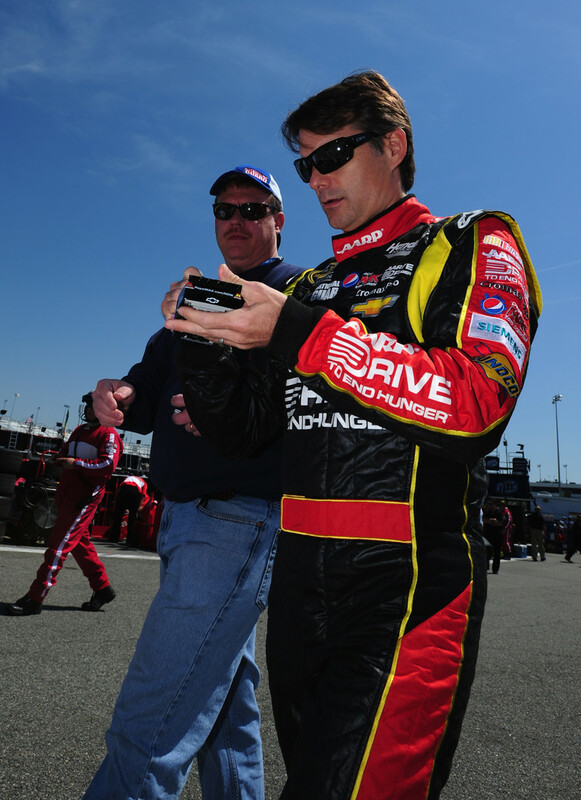 That’s what separated Jeff Gordon from the NASCAR Chase after 26 races this season. Gordon finished 8th at Richmond International Raceway and missed the Chase cutoff for just the 2nd time in the 10-year history of the Chase. Gordon was in position to make the Chase in the closing stages. 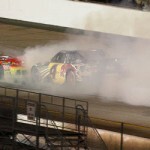 However, a spin by Clint Bowyer (ironically) changed the complexion of the event. 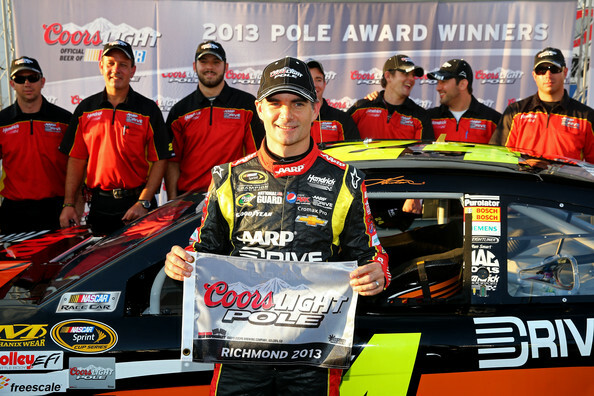 Gordon started on the pole and led the first 49 laps before Brad Keselowski took the lead away. Kurt Busch followed Keselowski past Gordon, which dropped him to 3rd place on lap 51. He fell to 5th on lap 61 when Jamie McMurray and Clint Bowyer went by. He faded to 8th place by lap 75 after wearing out the right rear tire. Gordon fell out of the top-10 on lap 86 when Kasey Kahne moved ahead. Gordon came to pit road on lap 94 for a green flag stop. He cycled through in 12th place and ran there at lap 100. Gordon moved to 11th by passing Kasey Kahne on lap 123. The first caution waved on lap 135 which brought the field to pit road for adjustments. 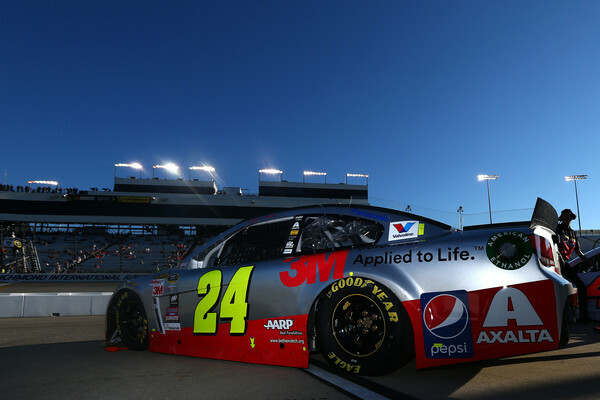 Gordon gained 3 spots on pit road because of the first pit stall and restarted in 8th place. Gordon held 8th until lap 177 when Greg Biffle and Aric Almirola went by to send him back to 10th. As the handling went away, Gordon fell to 15th on lap 186. A caution for David Stremme’s spin on lap 208 brought out the caution. Gordon restarted in 16th place after adjustments on pit road. On lap 224, Gordon dropped off the pace and came to pit road after reporting a vibration — which turned out to be a loose right front wheel. 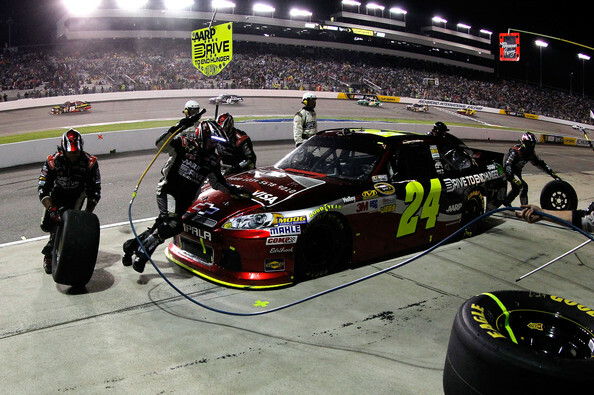 The crew changed four tires and Gordon returned to the track two laps down in 25th position. He tracked down and passed Brad Keselowski to put himself one lap down on lap 231. 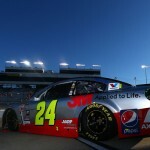 On fresher tires he was able to gain spots on the drivers one lap down and ran 23rd on lap 255. 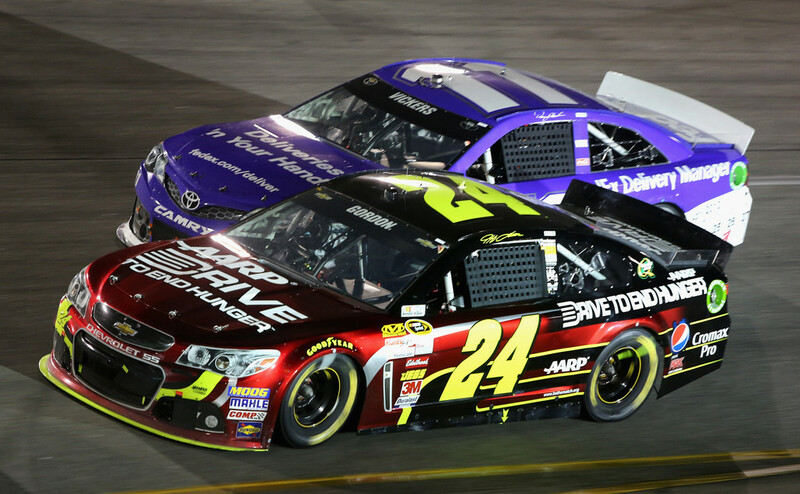 Seven laps later, Gordon passed Brian Vickers to move into 22nd place — the free pass position if a caution waved. A debris caution on lap 264 allowed Gordon to get back on the lead lap to put himself in position to qualify for the Chase. 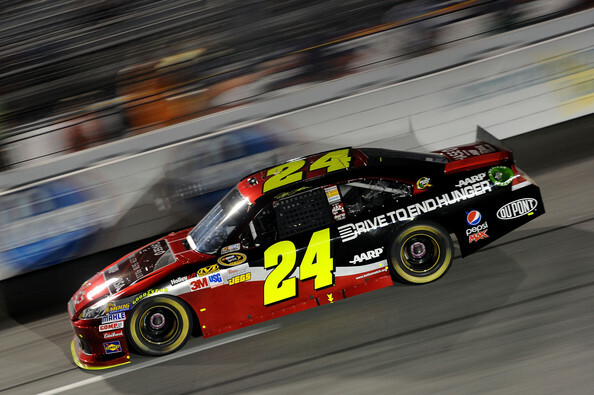 Gordon restarted 22nd on lap 274 and entered the top-20 soonafter. He took 19th place from Denny Hamlin on lap 292 and moved to 18th around Almirola 10 laps later. Gordon moved to 16th with 87 laps to go. 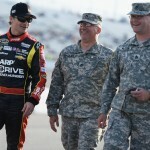 With Joey Logano trapped 2 laps down, Gordon essentially needed a top-10 finish to qualify for the Chase at that stage of the event. He took 15th from Matt Kenseth with 75 laps to go, and took 14th from Martin Truex two laps later. Gordon came to pit road with 58 laps to go, just before Jimmie Johnson cut a tire to bring out the caution flag. He rolled through pit road and was the first car one lap down, which allowed him to get back on the lead lap. Gordon restarted in 12th place with 50 laps to go. 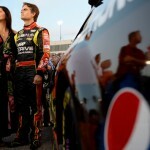 He entered the top-10 with a move around Mark Martin, and took 9th from Ricky Stenhouse with 35 to go. 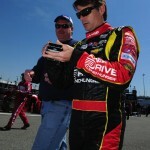 He took 8th from Kenseth with 30 to go, which gave him a 2 point edge for the 10th and final Chase cutoff. Clint Bowyer’s spin with 8 laps to go brought out the caution. Gordon had a difficult time gaining spots on the restart and finished the event in 8th place. However, Joey Logano advanced from 25th to 22nd after the final caution allowing him to edge Gordon for the final Chase spot. Clint Bowyer spins with 8 laps to go. 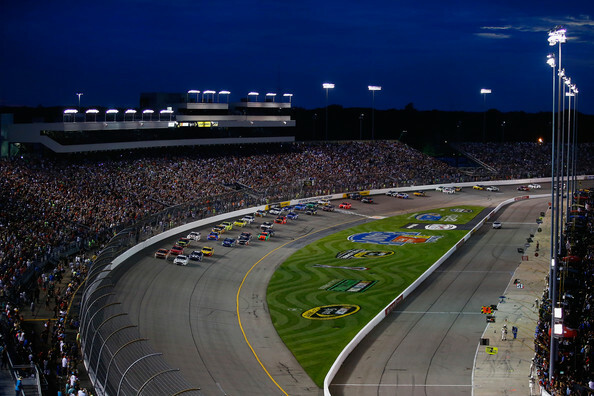 Kevin Harvick came on late and scored his first victory of the 2013 season under the lights at Richmond International Raceway. Juan Pablo Montoya appeared to be cruising to his first win since 2010, but a late race caution flag brought pit strategy into play. 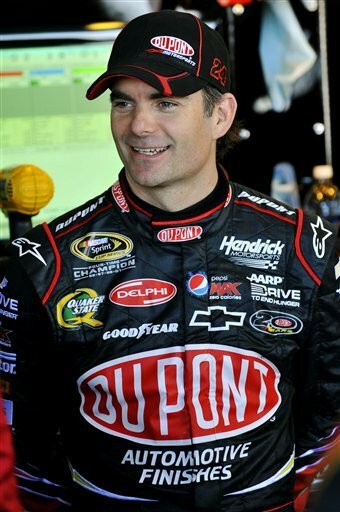 Jeff Gordon struggled with handling in the first half of the event before rallying back to 11th place at the finish. Gordon started 3rd and moved into the runner-up spot by the end of lap 1. He fell back to 3rd when Clint Bowyer went by on lap 14. Gordon battled handling issues and dropped to 5th on lap 20. He continued losing spots and ran 10th on lap 25. Gordon dropped to 12th prior to the first caution on lap 42. 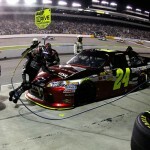 Pit stops followed with Gordon exiting in 14th place. After the restart, Gordon continued his backslide through the field and ran 18th on lap 55. He fell out of the top-20 on lap 62. At the 100-lap mark, Gordon ran in 25th place in danger of going a lap down. A caution for Marcos Ambrose on lap 110 slowed the field and brought pit stops. Adjustments were made on the #24 car and Gordon restarted 24th on lap 115. He advanced to 21st prior to the next caution flag on lap 145. 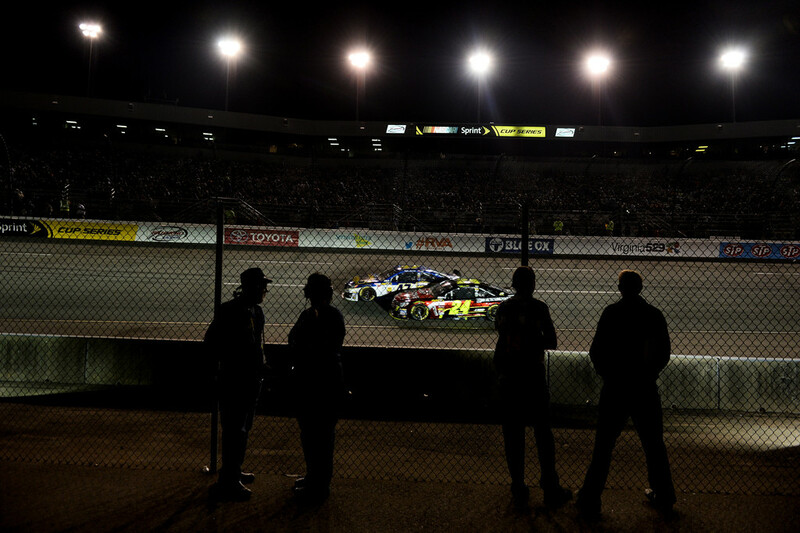 On the restart, Gordon moved from 23rd to 21st and then re-entered the top-20 on lap 158. A caution on lap 159 for Brad Keselowski’s wall contact brought Gordon back to pit road for tires. At the halfway point, Gordon ran in 18th place. Gordon moved up to 16th before a caution on lap 232. He held the spot through a round of pit stops. Gordon took 15th from AJ Allmendinger on lap 274 and took 13th place prior to a caution on lap 292. A caution on lap 307 brought Gordon back to pit road for tires and he restarted in 13th place. 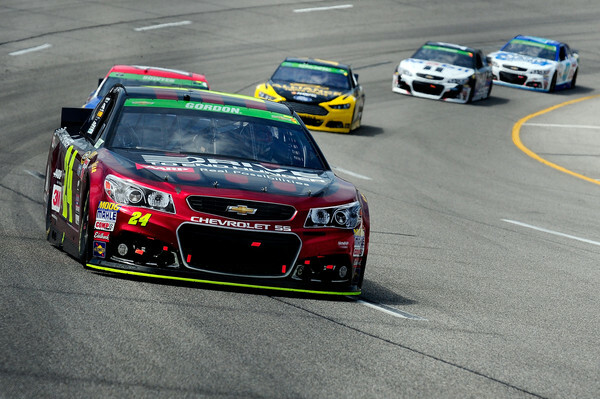 With 74 laps to go, Gordon moved into the top-10 when Tony Stewart and Jimmie Johnson made contact and spun in turn 2. Gordon came to pit road and restarted in 14th place. After the restart he dropped to 18th place, but gained two spots after Mark Martin and Kasey Kahne wrecked on the backstretch. Gordon stayed out during the caution period and moved up to 9th for the restart with 57 laps to go. 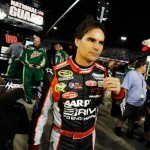 He advanced to 8th when Kurt Busch spun Martin Truex with 53 to go. Gordon fell to 9th with 22 laps to go, and slipped to 10th with 17 to go. His fade continued as Jamie McMurray dropped him out of the top-10 with 15 laps to go. Gordon was 12th when Brian Vickers brought out a caution with 5 laps to go. He came to pit road for tires and restarted in 14th place for the green/white/checkered finish. He gained 3 spots in the final 2 laps to post an 11th place finish. Gordon has just 1 top-10 finish in the last 7 races. However, he moved up to 14th in the series standings. Handling issues plagued Gordon for the balance of the event. He seemed to win the track position game late in the event and ran as high as 7th with 50 laps to go, but was unable to hold the spot. 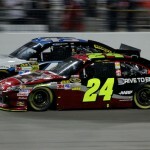 After 150 laps at Richmond International Raceway on Saturday night, Jeff Gordon exited his car during the rain delay dejected at the performance of the #24 Chevrolet. 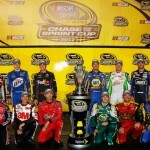 Broadcasters and media pundits began shoveling dirt on his chances to qualify for the NASCAR Chase. But, there’s a reason why the pundits hold a microphone (or laptop) instead of a steering wheel. When racing resumed, crew chief Alan Gustafson gave the four-time NASCAR champion a winning car. He drove through the field, got back on the lead lap, and finished 2nd in the race. 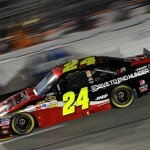 Coupled with Kyle Busch’s sub-par effort, Gordon gained the final Chase wildcard spot by a mere 2 points. 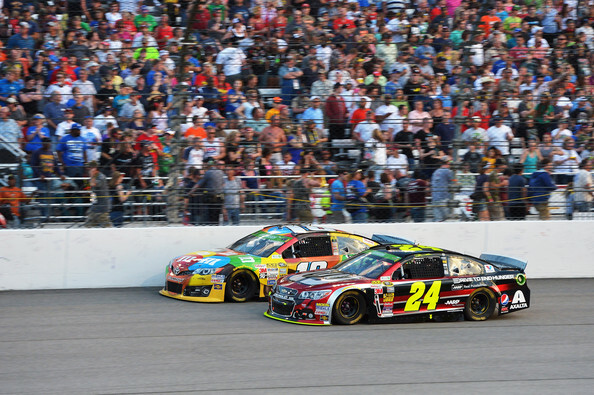 After rain showers pushed back the start of the race nearly 2 hours, Gordon started on the outside and the front row and moved to the lead on the backstretch. He quickly lost the top spot to Dale Earnhardt Jr. Clint Bowyer took 2nd from Gordon on lap 10. Denny Hamlin took 3rd from Gordon on lap 12. 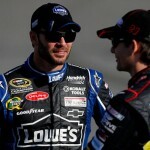 He slipped to 5th when Martin Truex passed on lap 18, and fell back to 6th when Jimmie Johnson went by one lap later. Gordon ran 7th at the competition caution on lap 46. Chassis adjustments followed on pit road and Gordon restarted in 16th place. David Ragan’s spin brought out the caution on lap 52. Gordon fell back to 19th on lap 62, but regrouped back to 17th by lap 75. At the 90-lap mark, Gordon had advanced to the 16th position. However, he dropped to 18th after complaining of a brake issue by lap 100. 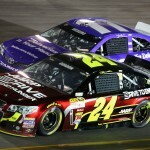 Gordon went a lap down on lap 128 when race leader Denny Hamlin went by. The caution waved on lap 135 for rain. Pit stops followed and the #24 team made chassis adjustments. Gordon returned to the event in 26th place, and remained a lap down. Rain became heavier and the race was red flagged for nearly an hour. The event resumed just before midnight eastern time. Gordon moved up to 21st by lap 175 and moved into the top-20 on lap 177. However, he was unable to gain ground in the hopes of becoming the first car one lap down. Green flag pit stops came on lap 220 with Gordon cycling through in 23rd place. A caution for Clint Bowyer’s spin on lap 235 saved Gordon from going a second lap down. Following a stop, Gordon ran down and passed Carl Edwards for 17th place on lap 245, which put him in position for the free pass at the next caution. He got the needed caution on lap 275 for a brief rain shower to get back on the lead lap. Gordon changed tires and restarted in 17th place. With 100 laps to go, Gordon had advanced into the top-10. He moved to 9th three laps later, and took 8th place with 90 laps to go. With 80 to go, he had advanced into the top-5. Gordon moved to 4th with 70 to go and went by Kyle Busch who was lapped. He fell to 5th when Hamlin passed with 60 to go. He came to pit road for a green flag pit stop with 40 laps to go. He returned to the event in 11th place and moved up to 8th within 10 laps. With 25 to go, he was running 8th while Kyle Busch was holding onto 18th. With 20 to go, he took 5th from Brad Keselowski to pull into the final Chase wildcard spot. With 7 to go, Gordon took 2nd from Mark Martin. 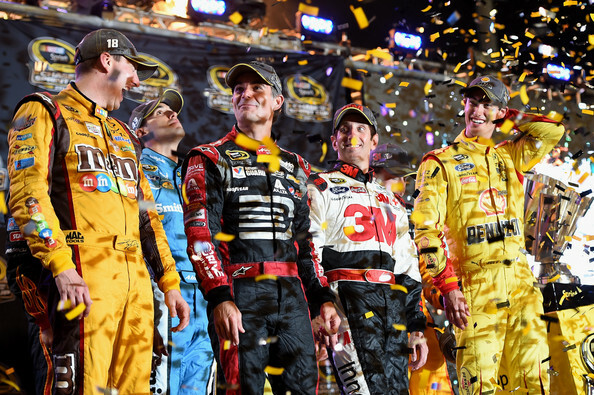 It was a tale of two races for Gordon — before the rain delay and after the rain delay. After struggling with handling in the first 150 laps, the crew made large-scale adjustments to the suspension on the #24 car. Gordon’s car came to life in the second half of the event, which punched his ticket into the Chase for the Championship. 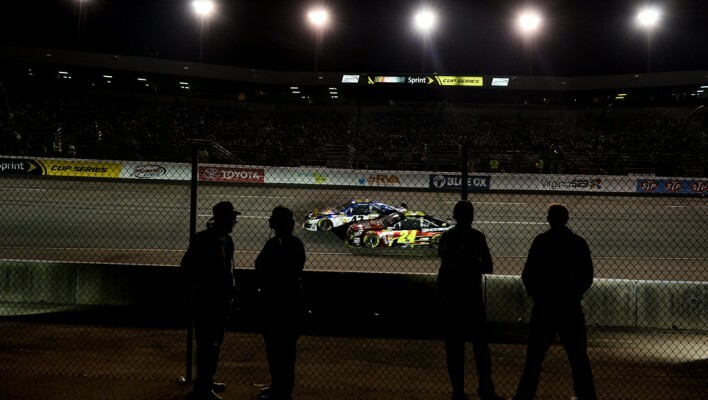 Once again it was the wrong place at the wrong time for Jeff Gordon as an early race cut tire sealed his fate before the race was an hour old. Contact from Aric Almirola sent Gordon into Greg Biffle’s car in turn 1 resulting in a cut tire. 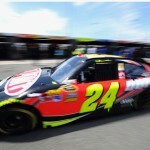 Gordon was unable to make up the two lost laps and finished 23rd — his 6th finish of 21st or worse in the last 11 races. 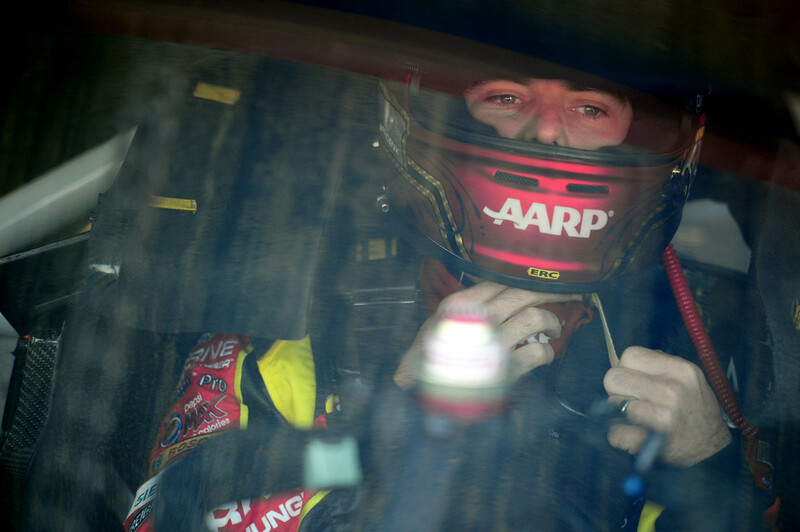 Gordon started 6th and fell to 10th in the opening 10 laps while battling a tight handling condition. He dropped four more spots by lap 30 and ran half a lap behind the leader. A competition caution brought the lead lap cars to pit road on lap 50. On the restart, Aric Almirola pushed up the track into Gordon’s line. The #24 car sustained damage after hitting Greg Biffle in turn one. Gordon limped around the track and came to pit road with a flat tire. 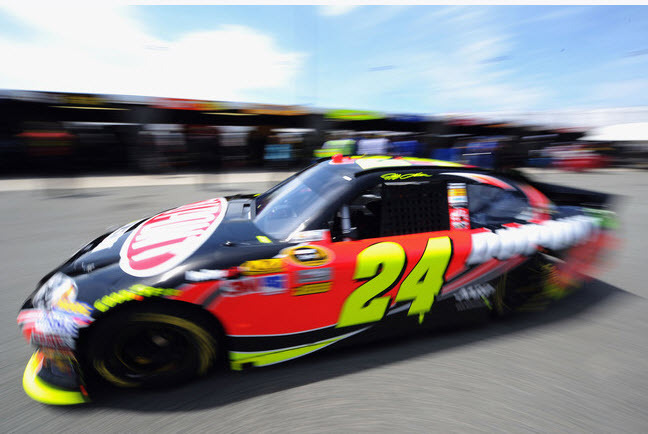 Gordon lost two laps after the green flag pit stop and ran in 35th place. A caution on lap 117 for Kurt Busch’s spin kept Gordon from going a third lap down as race leader Carl Edwards was closing on the #24 car. Gordon moved up to 31st place by lap 130, but remained two laps down. 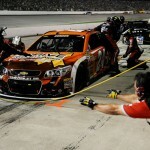 He pitted under green on lap 205 during a cycle of pit stops and remained two laps down on the track. During a debris caution period on lap 230, Gordon stayed on the track for the wave-around and restarted 1 lap down in 29th place. However, he fell 2 laps down when race leader Kyle Busch went by on lap 301. Gordon came to pit road for a green flag stop on lap 304. As the laps wound down, he moved up to 25th place, but remained two laps down. At the front of the field, Kyle Busch beat the field off pit road on a late race caution and pulled away from Dale Earnhardt Jr to win his first race of the season and 24th of his career. Contact from Aric Almirola’s car on a restart on lap 53 sent Gordon into Greg Biffle’s quarterpanel resulting in a cut tire. 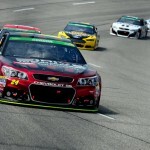 Jeff Gordon patiently worked through an early crashfest and mid-race handling issues to take the race lead with 23 laps to go at Richmond International Raceway. 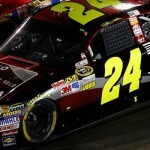 However, a late caution flag resulted in Gordon losing the lead on pit road. He dropped another spot on the restart and finished 3rd. 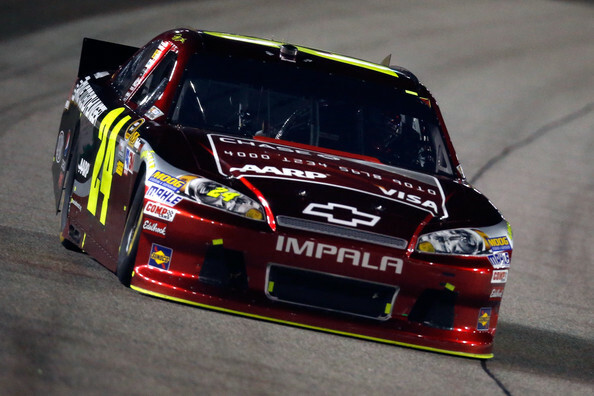 It was Gordon’s 9th top-10 finish in the last 11 races as he heads into the Chase for the Championship. Gordon will enter the Chase trailing Kyle Busch and Kevin Harvick by 3 pts. Gordon started 17th and moved up a spot before the first caution for Andy Lally’s spin on lap 3. After another caution, Gordon worked his way to 12th place on lap 25. Gordon got into the left rear of Kasey Kahne’s car on lap 27. His future Hendrick Motorsports teammate spun into the wall to bring out a caution flag. A caution for Marcos Ambrose’s spin on lap 38 slowed the field once again with Gordon up to 10th. On the restart, Gordon faded to 14th before Kahne slammed the wall on lap 52 after contact from Brian Vickers — due to Ambrose tapping Vickers. Gordon came to pit road and restarted in 21st place. He moved up to the 12th spot by lap 100, and took 8th place 25 laps later. 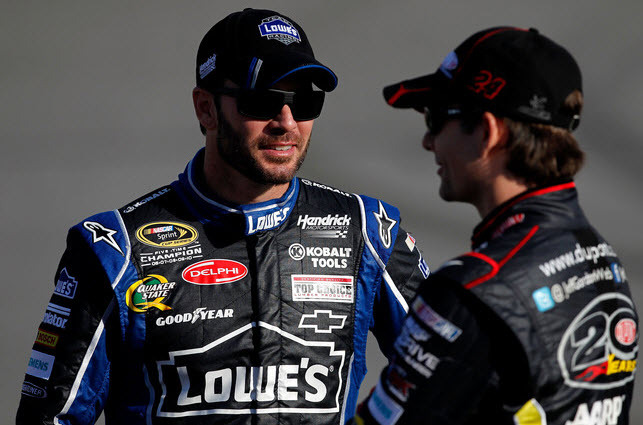 Incidents involving Jimmie Johnson and Kurt Busch slowed the field near the halfway point. Gordon’s car came to life following a stop on lap 231. He advanced from 12th to 6th by lap 280 before a caution for Jeff Burton’s wall contact. Gordon came to pit road on lap 298 after Joey Logano’s blown engine slowed the field. He restarted in 14th place and quickly moved to 7th before another caution with 90 laps to go. Gordon came to pit road and took four tires. He restarted in 5th place with 86 laps to go. Gordon moved into 4th with 80 laps to go, and took 3rd from Carl Edwards two laps later. 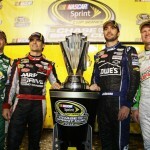 He worked his way around Greg Biffle for the runner-up spot with 65 to go and closed in on race leader Kevin Harvick. 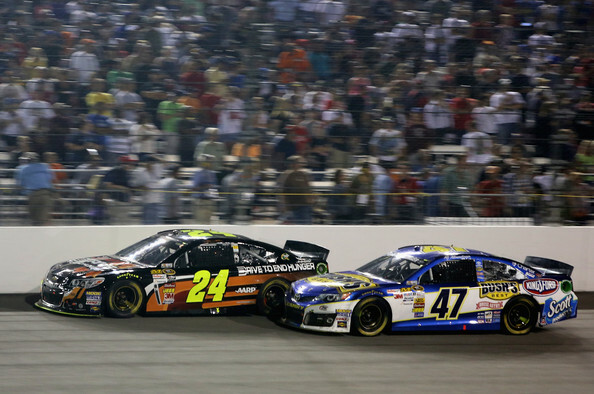 Gordon took the lead from Harvick with 23 laps to go and began pulling away. However, Paul Menard’s spin with 17 to go brought out the caution. 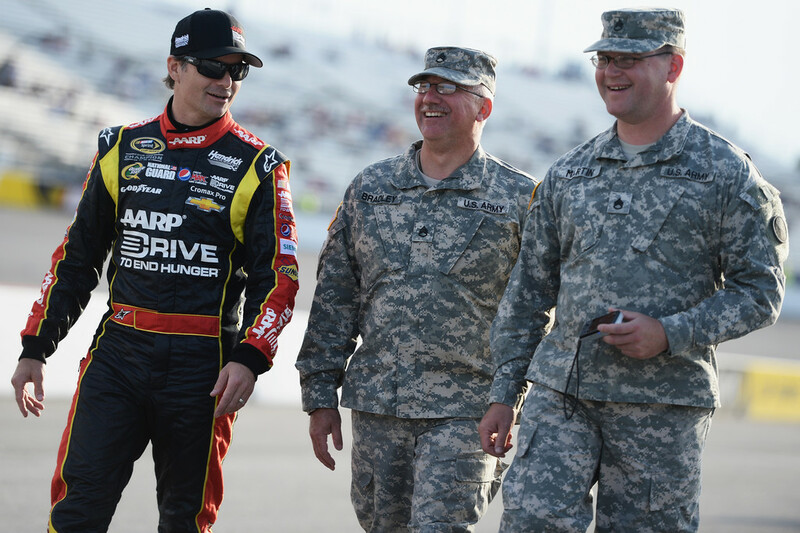 The leaders came to pit road with Gordon exiting in 2nd place behind Harvick. He dropped to 3rd behind Carl Edwards after the restart and slipped to 4th when Kyle Busch went by. He passed Busch with 8 laps to go to re-take 3rd place. 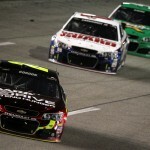 However, he was unable to close in on Harvick or Edwards and finished 3rd. 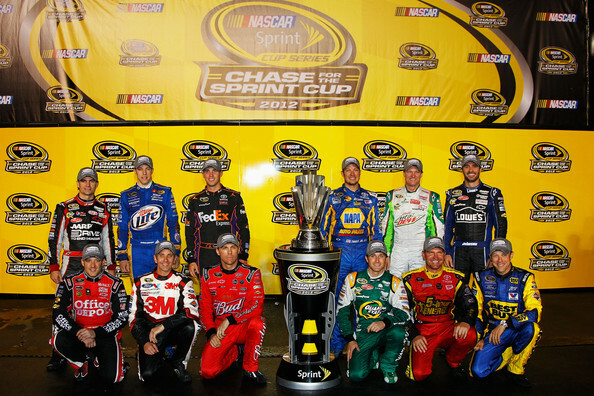 Road ahead: The Chase for the Championship begins at Chicagoland Speedway. 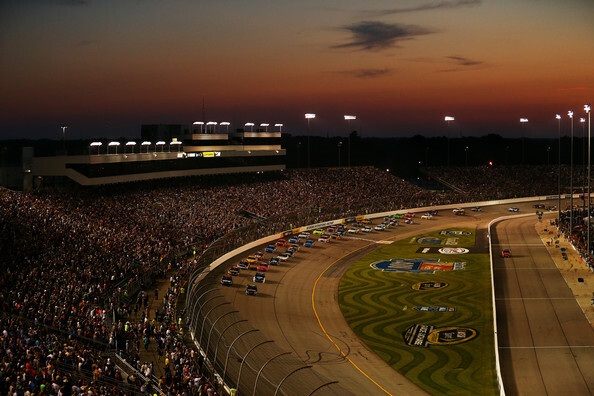 This is the first time Chicagoland will host a Chase race. 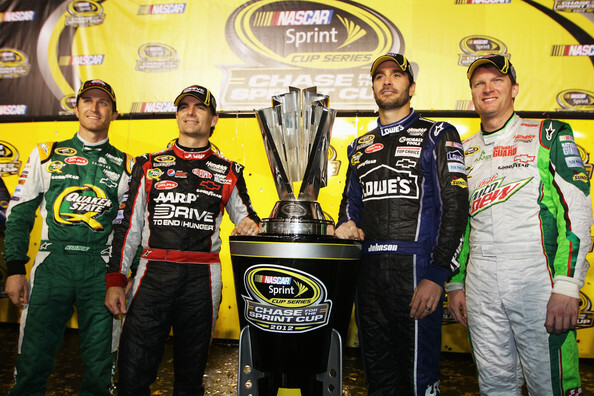 The 10-race Chase resets the points and determines the series champion. 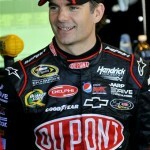 Jeff Gordon started 6th and was hooked up from the ouset as he moved to 3rd on lap 10. 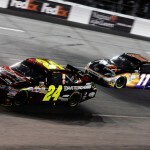 However, Gordon battled a loose handling condition going into the corner and was unable to make headway toward the lead. He dropped to 4th at the 70-lap mark and fell to 5th when Kyle Busch passed. He came to pit road for a green flag stop on lap 89 and cycled through in 9th place. At the first caution flag on lap 104, Gordon was up to 6th. Gordon’s handling improved after a pit stop and he took 3rd from Clint Bowyer on lap 120. Shortly before the halfway point, Kurt Busch’s wall contact brought a caution to slow the field. Gordon came to pit road and exited in 3rd behind Kyle Busch and Denny Hamlin. On the restart he moved to 2nd behind Busch. Gordon briefly took the race lead for 3 laps before Busch re-assumed the top spot on lap 205. A caution on lap 236 brought Gordon to pit road for a track bar adjustment. 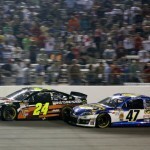 He lost positions battling a loose car and returned to pit road 15 laps later when Jimmie Johnson wrecked Joey Logano. With 100 laps to go, Gordon ran in 5th before a caution for Brad Keselowski’s spin. After pitting, Gordon restarted 12th and was the victim of a wreck on the backstretch when Matt Kenseth got turned. Gordon spun across the track and slammed the inside wall on the backstretch. He climbed from the damaged car under his power and was credited with a 39th place finish — his worst finish since Michigan in August 2008. 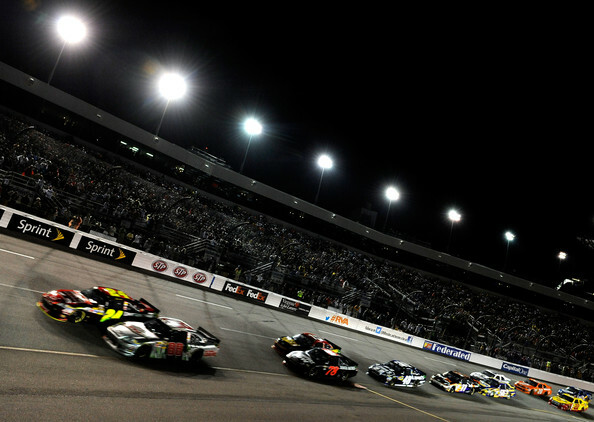 Road ahead: The series heads to the 1.36-mile Darlington Raceway for a Saturday night affair. 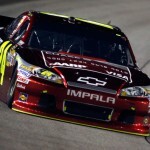 Gordon’s performance on intermediate tracks has been an uphill climb in 2011. 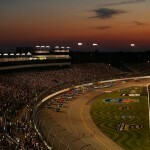 However, Darlington is far from the typical intermediate track with its narrow and abrasive racing groove. YOU SAID EVERYONE WAS LOSING THEIR PATIENCE OUT THERE INCLUDING YOU, IS THERE A LOT OF BEATING AND BANGING GOING ON OUT THERE? Uh Oh, better get Maaco! When there was a chance.